Happy to be a guest writer again for my good friend Jennifer! When I read the passages for today, I knew right away I did not want to write about Ahab’s family being killed. I was not sure what to pluck out of Hosea 2 either. Something more uplifting was needed after a long week! 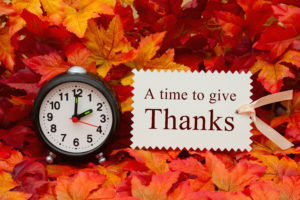 As we are approaching November, the “Thanksgiving” headline in 2 Timothy caught my attention as we always have lots to be thankful for each day. November gives us the opportunity to reflect on all we have been given in our daily lives, not in terms of the usual Thanksgiving Day prayer of family, friends, health, happiness, freedom….more in terms of what God has given to us to help us live our daily lives. In the readings related to Thanksgiving, three separate verses jumped out at me. 7 For the Spirit God gave us does not make us timid, but gives us power, love and self-discipline. When I read these verses together, they make me think of being modest and content. I think this because of what the Spirit God gave us, makes us. In the first verse it talks about the Spirit God making us powerful and able to love, but it also mentions self-discipline. Power and love are two very important things/traits that if used wrongly, can do major harm. By adding self-discipline into our making, the Lord provides us with not just having these two strong powers, but he provides us with a third trait that is a very important: self-discipline. Self-discipline provides us with being able to stay content in times of despair and it provides us with being modest in times of great achievement. Self-discipline helps us not go over the edge when given the traits of power and love. To me, this means that God gave us the ability to have power, love, and self-discipline. He has also saved us and called us to an eternal and holy life in heaven, and there is nothing we can do to make God hate us, for he is loving. It also says to me that there is a little bit of the Holy Spirit inside of us all, and that should mean the world to us. These verses all talk about the amazing spirit God has given us. We should take this blessing and spread/show it to others in the world. God has given us this gift, and we are meant to use it to follow him and to love him. We are meant to hold onto this gift as well because it defines us and keeps us close to God. Interesting to read how teenagers translate God’s word in their lives. To me, I hear God giving us Power, Love, and Self-Discipline. He gives us these traits to use wisely. I hear him reminding us that we need to focus on listening to the Holy Spirit within ourselves to help us lead a Christian life. Even when we don’t, we can be saved through his Grace. What a wonderful gift! Do we think about using the power of the Holy Spirit each day? Are we thankful that God leads us through in thought, word and deed? As we enter the month of thankfulness, let us recognize God’s power, love and self-discipline he has given us along with his Eternal Grace.